Y'all, there's nothing we love more than helping our friends and neighbors find the perfect home to suit their needs. Lois just assisted a client sell a downtown home and buy a charming cottage out on Sullivan's Island. This week, join artist and physician McLean Sheperd and her life coach husband Emmett Lynch in their great adventure in search of sparkle! McLean had been living in downtown Charleston for the last 25 years and was ready for a new Lowcountry vista and experience. 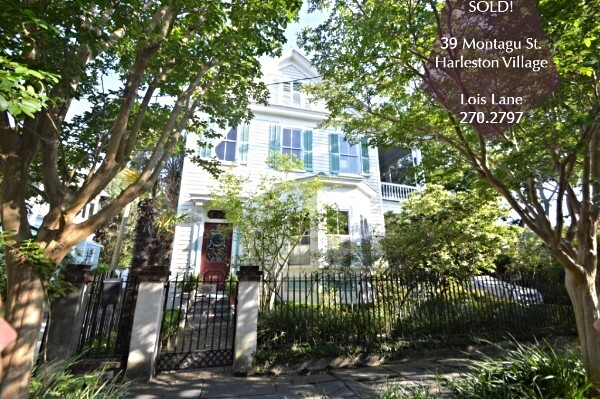 Her former home at 39 Montagu Street is a Queen Anne version of the traditional side-hall, double-parlor-plan Charleston single house built by Harriet R. Simmons circa 1881. At 4,200 square feet, it was a lot of space to ramble around in, and the two-person, two "dog-ter" family was looking to simplify. McLean says, "I love Montagu Street--number 39 is a real deep soul of a home. She really only has had two real owners (with a brief stint of renters in between). I will always love her and know that the family who will be with her next will be surrounded by peace and comfort." Lois had a contract on this home only five days after listing it for sale! Interested in historic Harleston Village? Check out current Harleston Village listings and learn about other downtown neighborhoods as well! 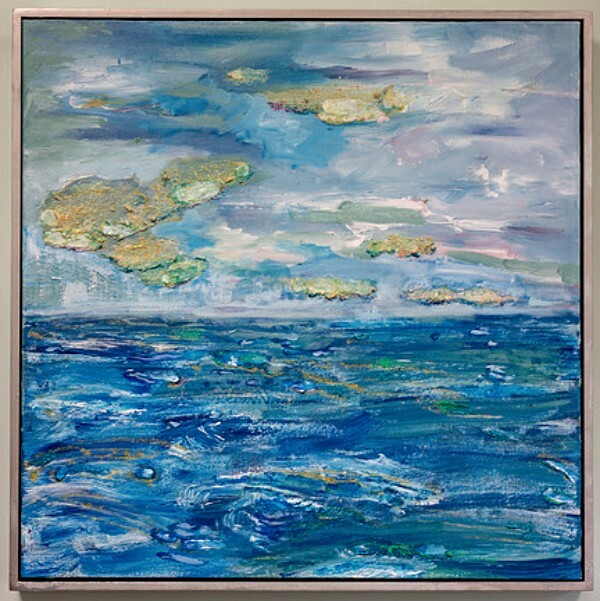 As an artist and physician, McLean believes that art represents a critical aspect of healing--for the individual, culture, and the planetary community. "All people need to express their imagination through art-making to be truly whole. When a person engages creatively with the world, it shines forth as inner vitality, confidence, and beauty." She's drawn to things that "sparkle" as can be seen by the metallics and glitter used in her artwork, which y'all probably saw at Eleanor's Pop Up Art Show in our offices. When they made the decision to look for a new place to live, she and her husband Emmett decided that it would have to be for "sparkling water." McLean said, "While I love the marsh and other natural vistas of our fair city, the sparkle was a goal that kept us searching the coastal waterways for the ideal place for our family." 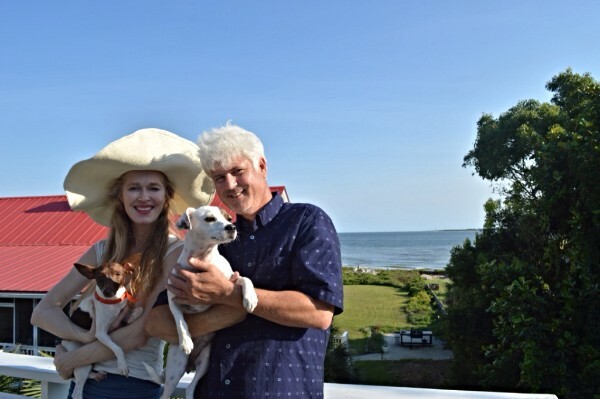 McLean and Emmett with their "dog-ters" Lulu and Bella at their new Sullivan's Island home. McLean said they were looking for something around 2,000 square feet, but that smaller places are actually harder to find than you might expect. "So, finding [the house on] Middle Street at its cozy 1,700 foot (plus porches and a garage underneath) felt like a dream come true!" Moultrieville is the historic western portion of the island jutting into the harbor that was incorporated in 1817, where two-room "keeping houses" were built by wealthy Charlestonians in order to claim lots. The island was used primarily as a health retreat and vacation spot until the early 20th century. Most of the homes in Moultrieville are one- and two-story wooden cottages with porches, the earliest remaining structures dating back to around 1890. Many of them have been added to several times over the years, but still retain the island cottage feel. In the case of Emmett and McLean's newfound two-story home, it's been hoisted atop a garage. This additional height enhances the view from rooftop deck, giving this home perfectly sparkly panoramic vistas! Congratulations on the closing this week, McLean, Emmett, Lulu and Bella...we are so happy for you. Has this made you curious about what else might be out there on the market? Check out the current listings on Sullivan's Island and the rest of our local beaches!